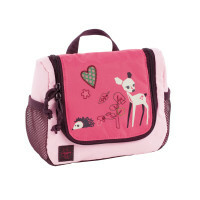 The children's toiletry bag Little Tree Fawn with well organized compartments and further pockets fit all kinds of care products. Product information "Mini Washbag, Little Tree Fawn"
description & equipment The children's Lassig toiletry bags with a well organized main compartment fit all kinds of care products such as a hair brush or shower gel. Toothbrush, toothpaste or even small hair clips can be placed in the two inside mesh pockets or in the separate zipper pocket. The hook for hanging the bag and the removable mirror included in the set are especially useful. 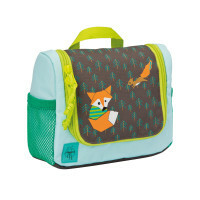 The two side mesh pockets are ideal for wet items, complementing this practical accessory set, which is available in various designs of the Wildlife and other children's collection. A small clear name badge sleeve is on the reverse side to ensure that the toiletry bag won't get lost.